There aren't a whole lot of things my pie hole can spew from memory. John 3:16, my kids' birthdays, and the Second Amendment. And, if you hadn't noticed, two out of those three are controversial to at least some degree for some people. I get goose bumples all the time whenever I stop and think, and actually ponder, the significance of all three of those things I've committed to memory. I won't get into a Bible lesson, but I take it quite literally. The kids are human beings I actually helped create. Three things, actually. And, if I were being honest, that's kind of a scary proposition when you think about it. And finally, the topic of this article, the Second Amendment. Our themed week dedicated to combat gun control wouldn't be complete without breaking that Amendment down as far as we can keeping in mind that I'm not an attorney at law. I'm just a regular guy trying to navigate this thing called life as successfully as I possibly can. So what I'm trying to say, is that I'm no expert. What I do have, though, is actual, real life common sense with a set of eyeballs able to read, and a fully functioning brain. to keep and bear arms shall not be infringed. All three parts are equally important, but for the sake of ease let's tackle that first section, first. But, before we do, we need to have a solid understanding of where our founders were coming from. These United States of America were re-born out of war. Not just war, though. We had a parent who was abusive and we sought to be born, again, in freedom. The Red Coats taxed us. They treated us poorly. They made an attempt to confiscate our founder's guns, and were successful in at least one area of New England, Boston. They took the American's guns for “temporary safekeeping” and never gave them back. The people were not happy. In fact, according to many historian scholars that was one of the tipping points for us earning our freedom as we went to war with Great Britain shortly after that fact. Here's the interesting part, when the 2A was written, everyone was considered militia. Today that term gets thrown around like it's a bad thing, but, truth be told, there were Army Regulars and then there were local militias made up of farmers, blacksmiths, and bankers. If you were an able bodied man, usually about 16 years of age or older you had a gun. You trained with your gun. And, you were ready to mobilize against a tyrannical government ruled by militant leaders at the drop of a hat. In other words, they were regular people. Citizens. They were you and I–freedom loving Americans. When the Second Amendment was penned, it was understood that the militia was necessary for freedom. And that, my friends, is what the first subsection of the Second Amendment says: The militia is necessary for freedom. It was necessary to win over freedom as well as to keep that precious freedom. The founders understood this because they had endured it first hand. Great Britain at the time was a Tyrannical government. They're one of our greatest allies now, but it wasn't always peaches n' cream. Let's move on. Subsection two is conveniently easy to understand as a free people. We are still the freest nation on the planet, even though our freedoms are continuously withered down by those who hate it. The Right of the People. … to keep and bear arms shall not be infringed. 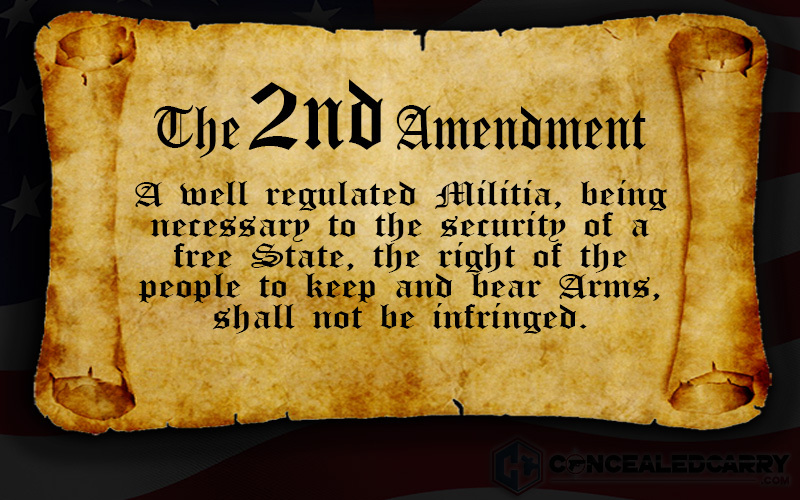 We'll get to the keep and bear arms part in a second, but let's focus in on the shall not be infringed part. Not only is that thing a RIGHT, it SHALL NOT BE INFRINGED. They went so far as to say it two different ways so it couldn't be confused. The Right of the People … Shall not be infringed. The Right of the People … Shall not be infringed. The founders chose their words very carefully when they penned the Second. If you notice, they didn't say “should not” “would not” “will not” won't be” or anything else they could have said. They said SHALL NOT BE INFRINGED to negate any confusion. Interesting concept to say the least. What ever that Right is must be important. I mean, it's a Right that Shall not be infringed. Right? So to break it down Barney style (think big, purple dinosaur), it means that you cannot violate or encroach upon a right. What Right I hear you asking? To keep and bear arms. BOOM! Mic drop. But WAIT!!! There's More!!! Let's dissect the words keep and bear, as well as the word arms. Now let's put it all together to see what we've come up with in terms even a child could understand. The Second Amendment essentially means this: Citizens are necessary for freedom, and guns are a necessity to keep that freedom. So much so that citizens have the right to possess and carry guns on or about their person to prevent tyranny from ever taking hold in this country again and nothing could EVER take those guns away from the citizens. Too bad I already Mic-dropped or I'd do it again. Finally, we have the intent of the Second Amendment as written by the founding fathers. What did they mean when they wrote it? Naysayers will say that a “well regulated militia” means the National Guard who serves as a final force to be reckoned with should an invasion occur. But, if we were to take what the founding fathers have said we see that it is much more than that. Remember that the founding fathers were those who declared us free, wrote the Constitution, and several supporting documents like the Federalist Papers. Americans have the advantage of being armed to defend themselves and their country/state. And, other governments are afraid to trust people with arms, outside of the military. That's where we're headed, folks. There are plenty of people in our gooberment who don't trust us with arms. You know what I say? Too effing bad, and, I hear Canada is nice this time of year, don't let the door hit ya where the Good Lord split ya. You can't really disagree with the writing from the man himself. America is armed. To the teeth, as it were. Deal with it. You can find that Federalist Paper and many others, here. If there is ever any doubt what is meant about something of old, just reading what the folks who wrote that thing believe in their own words should be enough to squash any doubts. Let us know what you think about what I said here in the comments below. And, if you have a moment please share on your social page. Oh, and go vote. Please. Hi Josh. Just read your article. Good for you and having the nuts to say so. I would go even further and say that any law that prevents me from owning ANY kind of weapon is a violation of the 2nd Amendment. I should be able to own a full automatic pistol or rifle if I can afford it and purchase it. Whatever the Gubmint owns, I should be able to own it too. Every law on the books that denies me that right is unlawful. So…….